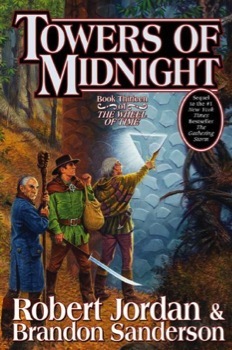 Towers of Midnight is the penultimate thirteenth novel in Robert Jordan’s Wheel of Time Series (now continued by Brandon Sanderson). The book won’t hit bookstores until November 2nd, but there’s a new book trailer that might help you pass the time while you wait. It’s the first official book trailer created for the Wheel of Time series, and it was produced by Dragonmount.com and Mythmakers Entertainment. The Last Battle has started. The seals on the Dark One’s prison are crumbling. The Pattern itself is unraveling, and the armies of the Shadow have begun to boil out of the Blight. The sun has begun to set upon the Third Age. Perrin Aybara is now hunted by specters from his past: Whitecloaks, a slayer of wolves, and the responsibilities of leadership. All the while, an unseen foe is slowly pulling a noose tight around his neck. To prevail, he must seek answers in Tel’aran’rhiod and find a way–at long last–to master the wolf within him or lose himself to it forever. Meanwhile, Matrim Cauthon prepares for the most difficult challenge of his life. The creatures beyond the stone gateways–the Aelfinn and the Eelfinn–have confused him, taunted him, and left him hanged, his memory stuffed with bits and pieces of other men’s lives. He had hoped that his last confrontation with them would be the end of it, but the Wheel weaves as the Wheel wills. The time is coming when he will again have to dance with the Snakes and the Foxes, playing a game that cannot be won. The Tower of Ghenjei awaits, and its secrets will reveal the fate of a friend long lost. This penultimate novel of Robert Jordan’s #1 New York Times bestselling series–the second of three based on materials he left behind when he died in 2007–brings dramatic and compelling developments to many threads in the Pattern. The end draws near. Dovie’andi se tovya sagain. It’s time to toss the dice. Please make sure to read our comment policy before posting a comment. Sign up to receive the latest updates from Book Equals by e-mail.